After many years of experience in delivering quality care for ear, nose, and throat conditions, Highgate Private Hospital is delighted to offer the innovative Earfold procedure – a rapid and revolutionary treatment for prominent/protruding ears. Prominent ears affect around 1-2% of the UK population and can affect your quality of life. The Earfold procedure has successfully treated prominent ears in both adults and children who require ear correction surgery. Earfold is a thin, curved, metal implant, approximately 5 mm wide and 15 mm long, that is made from a lightweight super-elastic alloy of titanium and nickel. It is safely and widely used in medical devices and is coated with 24-carat gold to reduce visibility under your skin. Led by some of the most trusted ENT surgeons, the Earfold® procedure is a minimally-invasive and relatively painless procedure performed under local anaesthesia. Mr Ravinder Natt, Consultant ENT Surgeon with a specialist interest in facial aesthetic surgery at Highgate Hospital, has treated a significant number of patients using the Earfold® implant and believes that it has truly revolutionised ear correction surgery. For your initial consultation, your Consultant will explore your requirements with you and how you would like your ears to look. Following this, one or two temporary positioners will then be used per ear to achieve the desired effect. 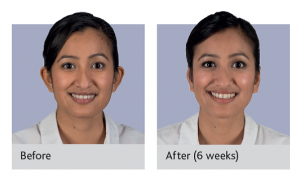 When you’re happy with the look anticipated, photographs will be taken to ensure that the same result is achieved when the permanent implants are inserted. 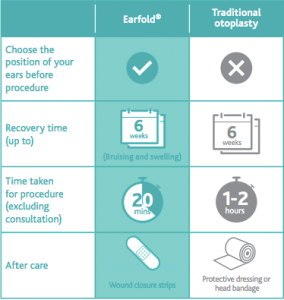 On the day of the procedure, your Consultant will administer a local anaesthetic and gently insert the Earfold® implant under your skin. 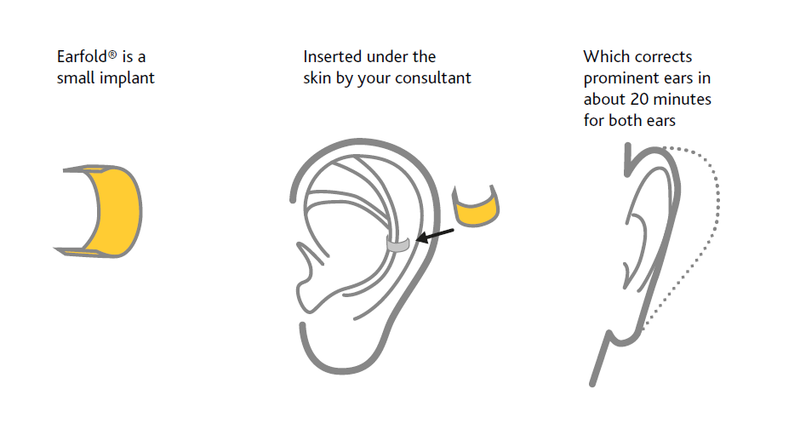 After it is inserted, the implant springs into shape, helping to correct your ear prominence. A comprehensive initial consultation offers you the choice to decide how your ears will look before the treatment. Sensitivity in your ears. For how long? Try not to smoke for at least 3 months as nicotine reduces the blood supply to your ear and greatly increases the risk of complications (this is also true of e-cigarettes and nicotine patches or chewing gum). Be gentle when washing your hair and showering. What are the prices for Earfold?